Many companies have established standardized operational practices for equipment maintenance and calibration. But when it comes to pH calibration, the established operational practices are often too vague or too complicated. The goal of this blog is to help shed light on the process and guide you towards making the right decision about whether to calibrate, clean, or discard your pH sensors. The best way to approach pH sensor calibration is to first create a calibration schedule: the sensor should be taken out of operation every day or two for a visual inspection. Look for any debris or fouling of the electrode and references surfaces. Then the sensor should be rinsed with distilled water and buffer check should be performed by placing the sensor in your calibration buffers and noting the readings. If the readings are within the specified tolerances in your operational procedures, a calibration is unnecessary at this point. Repeat this process every few days until you see a change in the visual appearance of the sensor or until the buffer check readings deviate from your specified tolerances. Once there is a change, it’s time to do some thorough cleaning. Always make sure that pH sensors are clean. It’s crucial to ensure that the glass electrode of the sensor does not become coated or plugged with contaminants. A slight coating can usually be removed by spraying distilled water from a faucet or a spray bottle. Thicker coatings may require a brushing and the application of a gentle acid. Applying dishwashing detergent and scrubbing is another option. For extremely stubborn coatings, a 2% HCl solution followed by a thorough scrubbing should accomplish the task. Be sure to rinse the sensor after cleaning to stabilize the pH. Perform another buffer check. If the results are within specified tolerances, you can continue to use the sensor. If not, there is another step to take before discarding your sensor. If the results are not in line with your tolerances, the final option is to soak the pH sensor overnight in a 4 pH buffer. If on the following day a buffer check shows readings that fall within your operational guidelines, then you can continue to use the sensor. If not, it’s time to get rid of it. Want to Learn More About pH Sensor Calibration? 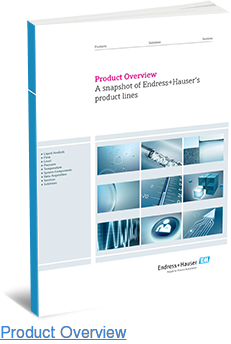 At Endress+Hauser, we realize that pH calibration is a complex process. 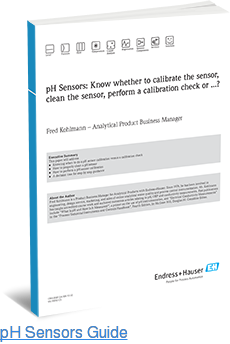 To make it a little easier, we developed a comprehensive guide complete with a step-by-step approach to deciding when to calibrate, clean, or discard a sensor. 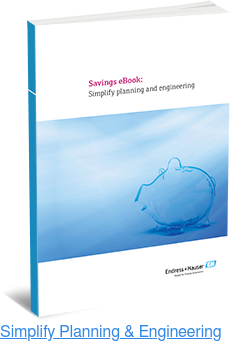 Visit our website to download your free copy of the guide.